Create A Cobbler Big Enough To Feed An Army With Just 5 Ingredients! This cobbler is a real gobbler! 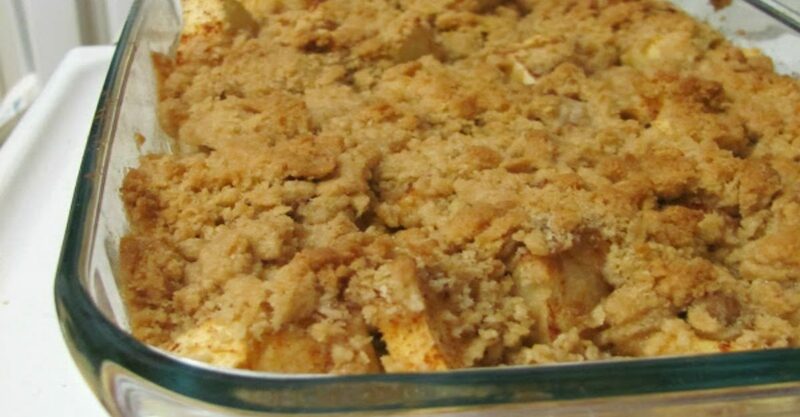 This holiday season, I have discovered apple crisp. My mom made it for a gathering and I was hooked. This was the best dessert ever – I couldn’t get enough of it! I came home and searched for a great, simple recipe and found this one. I keep a secret box of my ultimate favorite recipes and this certainly made its way to that box immediately! This recipe only has 5 ingredients and will be ready to go in no time. It is ideal for the holidays, but perfect year round. There’s nothing better than having this apple crisp with a generous scoop of vanilla ice cream on a warm summery day – except maybe having this straight out of the oven on a cold winter day! Recipe and photo courtesy of Hello Hue. Quick Tip: Remove the cinnamon if you simply want a sugary topping with no other flavors over your apples. Looking For A Different Kind Of Picnic Salad? Give This Dilly Delight A Whirl! What size pan is used? I would add just a hand full of oats to my topping. What size casserole dish are we talking about?